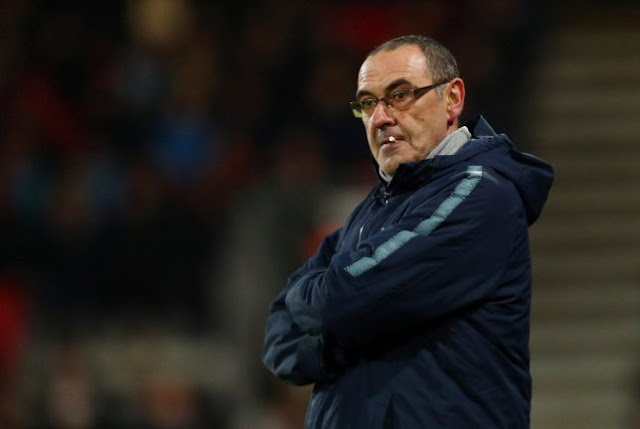 Former Chelsea striker, Chris Sutton, has said that the club will ‘sack’ manager, Maurizio Sarri before the end of this week. Sutton stated this following Chelsea’s 2-0 defeat to Manchester United in the FA Cup encounter on Monday night. The ex-England international believes that Chelsea’s defeat to Manchester United will be Sarri’s last game at Stamford Bridge. Goals from Ander Herrera and Paul Pogba ensured Ole Gunnar Solskjaer’s men knocked out Chelsea from the FA Cup. “This is Maurizio Sarri’s last game at Chelsea. He won’t survive. He’s done. “He’ll get the sack for numerous reasons – things he’s said, that he can’t motivate the players, his inability to be able to adapt and change,” Sutton told BBC Radio 5 live. Meanwhile, Speaking after the match, Sarri said he was worried about the result. “I am worried about the result, not about the fans,” Sarri said. “Of course I can understand the situation. I understand our fans, because the result wasn’t really good.